Ford topped third-quarter estimates, but here's a look at three other important aspects of its third-quarter results. 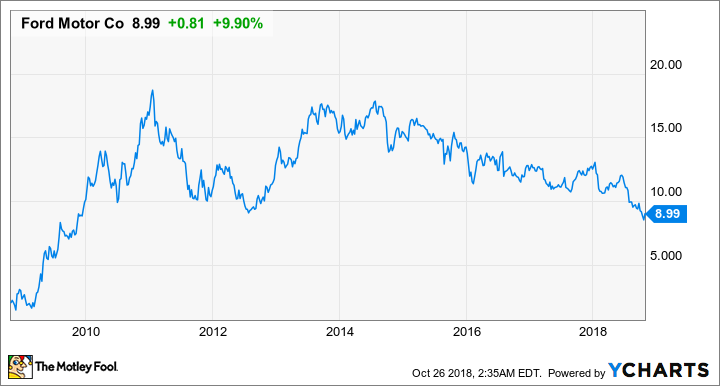 After a slightly tense second-quarter conference call with analysts, all eyes were on Ford Motor Company's (NYSE:F) third-quarter call, especially with the company's stock price having recently dipped under $9 for the first time since August 2012. Despite declining wholesales, Ford managed to grow revenue 3% compared to the prior year, and adjusted earnings checked in at $0.29 per share, topping analysts' estimates calling for $0.28 per share. But there was so much more than these top-level figures. Let's dig into the good, the bad, and the ugly from Ford's third quarter. Ford hopes its new midsize SUV, Territory, will help boost sales in China. Image source: Ford Motor Company. This category came down to a choice between the obvious North America business, which remains strong, and the often-overlooked Ford Credit business, so let's choose the latter. Ford Credit immediately jumps off the paper: It generated earnings before taxes (EBT) of $678 million, a 13% increase from the prior year. Ford Credit's strongest quarterly result in over seven years was driven by favorable lease residual performance and higher auction values, as well as favorable volume, mix, and worldwide credit loss metrics. To put in perspective how strong, and also how important, Ford Credit is, the $678 million EBT it generated essentially offset the $558 million EBIT combined loss from South America, Europe, Middle East and Africa, and Asia-Pacific. Notably, a blockbuster quarter for Ford Credit is also good news for the automaker's dividend. Despite plenty of talking heads and analysts calling for management to cut the dividend, save the cash, and focus on a turnaround, Ford has stuck to its guns and said it will maintain its dividend, in part due to changes with Ford Credit. To sum up a complicated subject, in the past Ford Credit's cash flow was reinvested in its business to increase its managed receivables. Now the cash generated by Ford Credit will be sent back to Ford to the tune of between $1.6 billion to $1.7 billion annually, which would cover roughly 70% of the dividend. Ford Credit had an excellent quarter, remains a bright spot for the company's total business, and will become an important factor to support the dividend. Still, there was some bad news during the automaker's third quarter as well. In the years following the past recession, Ford dug in and slowly improved its European operations, and turned a profit. In fact, Ford Europe even posted a record $1.2 billion pre-tax profit in 2016. Unfortunately, Ford now expects to post a loss in Europe for the year, and the third-quarter results were rough. Ford's market share dropped 30 basis points to 7%, and even though revenue increased 7%, its EBIT result plunged to a loss of $245 million, compared to the prior year's loss of only $53 million. Image source: Ford Motor Company's Oct. 24 third-quarter presentation. It's obvious why Europe doesn't belong in the good category, and the reason it's bad but not ugly is simply that there are many factors out of Ford's control. A large part of Ford's woes in Europe stem from the fact that Ford is the No. 1 brand in the U.K., where much of the automaker's European profits are generated. A weak British pound in the aftermath of the Brexit decision has been a huge speed bump. Another factor: launch costs for the all-new Focus, which will help boost Ford's business, weighed on the business. Many investors forget that while the Focus and the Fiesta are an afterthought for Ford's North America business, they're wildly important in Europe. Ford's result in Europe was bad during the third quarter, and it's disappointing to see evaporating profits. But many of the challenges are either out of Ford's hands or due to launch costs, and the company could work through those issues in the quarters ahead. But if you think Europe is bad, just wait until you see how ugly business was in Asia-Pacific. Ford lost ground in China as its aging product portfolio prevented consumers from driving its vehicles out of dealerships. China's seasonally adjusted annual rate (SAAR) of sales was down 10% during the third quarter, already creating a difficult scenario, but Ford performed far worse than the overall market. Ford's market share in China dropped 120 basis points, down from 4.1% to 2.9%, which drove total Asia-Pacific wholesales down a staggering 38% from the prior-year period. That, in turn, drove a 15% decline in third-quarter revenue, and sent EBIT tumbling $522 million lower than the prior year, to a loss of $208 million for the third quarter. Ford's aging product portfolio weighed on its volume and mix, as well as on net pricing. The good news: Ford plans to put its money where its mouth is and will launch 50 new models in China by 2025. That strategy is designed to send revenue surging 50% higher over that time. China will be a critical part of Ford's future, not solely because it's the world's largest auto market, but because it's likely to become the center of the electric-vehicle market, SUV growth, and smart-mobility business. Since Ford needs China to become a pillar of revenue and profit strength, especially as North America sales plateau, this quarter's showing was an unfortunate result for investors. The positive takeaway for investors is that the good in Ford Credit's third quarter was enough to offset the bad in Europe and the ugly in China. And after many investors had come to expect a dividend cut, and a miserable third quarter, Ford topping estimates and defending its dividend stance was enough to send the battered stock up 6% after hours.